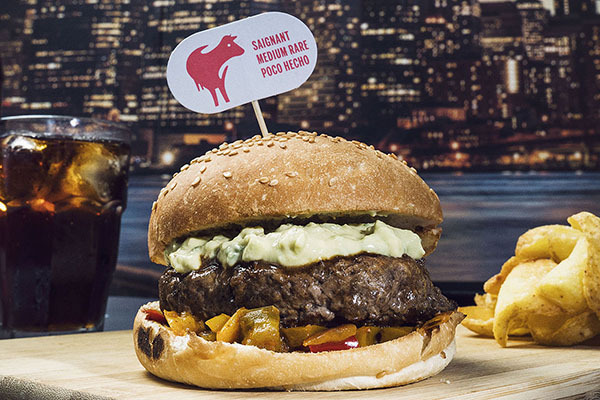 El Barrio burger: do not avoid to try this original burger suggestion, with guacamole topping and olive oiled fried peppers. A bit spicy. You can choose between Denominación de Origen Ávila Spanish beef; USDA American Black Angus beef; breast filet of free range chicken from Mercado de Antón Martín, grilled or handmade breaded at Skyline diner. Most of our raw ingredients come from local producers; which are not, come from USA like our Black Angus beef or some typical products as sweet pickle relish. Upon our craft brioch bun, all the burgers are served with fries and lettuce, tomato and red onion on the side, so you decide if you can add them on. This is a big difference from our most well known competitor, there you have to order them as an extra. Toppings: Caramelized onion, Fried onion, Peanutt cream butter, Black beans, Spicy fried peppers, Pickle, Cheddar cheese, Monterey Jack cheese, Sweet pickle relish, Rucula, Chive. Sauces: Aspen, BBQ, Bronx, Buffalo, Cesar, Curry, Fresno, Hoisin, Mayoki, Mint, Honey mustard, Cheddar cheese, Sour Cream, Tartiflette. Avocado, Smooky bacon, Guacamole, Fried egg, Crispy starred chinese vegetables. Raclette or Reblochon cheese, Topping Astoria, Topping Little Italy, Onions rings side. Foie. Chicken or Spanish beef double patty. Angus D. Patty. Take into account we do not deliver more than 3 km far away from our burger to avoid losses in quality arriving really cold. This wonderful pic is our El Barrio burger.